Do rankings accurately reflect your university? Dive into the data ranking organizations rely on. Rankings are influenced by research output and citation data. 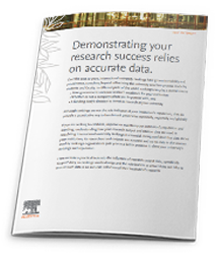 Are you confident that the data for your institution is accurate and complete? Establish, maintain or improve your institution’s reputation. Get to know how data are used for calculating university rankings. Ranking organizations rely on both Scopus data for its quality, transparency and comprehensiveness, and Elsevier’s analytical tools and services for their unparalleled power and flexibility. Analyze your institution through a similar lens and see how you benchmark against the global world of research. Don’t be hindered by inaccurate data. Better data drives better decisions. To help you, we have produced a number of reports: topic-driven examples of the breadth and depth of the analysis that Elsevier can provide on the state of research. We give you the tools and the information to make better-informed decisions at each stage of the research lifecycle. 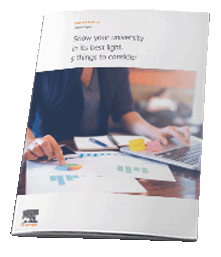 Are your university’s achievements reflected in rankings reports and assessments? Know what data goes into rankings and check if you’re taking the best approach to ensure accurate and complete information for your university. Research output and citation data play a significant role in rankings calculations. That’s why City University Hong Kong took steps to improve the accuracy of their data. How can you take a stand in your rankings? Research output and citation data, such as Scopus data, influences ranking calculations. Learn how Scopus data fits into the equation and what City University Hong Kong did to ensure a more accurate representation of their data. Scopus is the largest abstract and citation database of peer-reviewed literature curated by independent, external academic advisors. A visualization tool to analyze research performance of more than 11,500 research institutions worldwide.